iPhone Amplifier From Bone Collection! 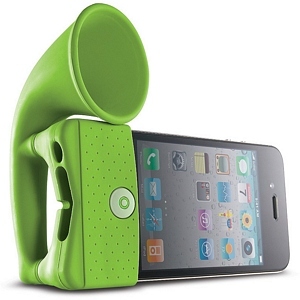 No battery is necessary for this iPhone Horn Stand Speaker from the Bone Collection! Add 13 decibels of sound pressure to your iPhone speakers using old-fashioned acoustical science. This silicone gadget stand can be placed in vertical or horizontal viewing position, and comes in black, light brown, white and green.